1. 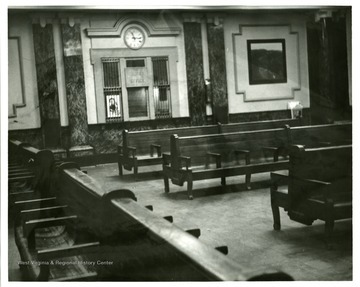 Interior of Train Station, Grafton, W. Va. Interior of Train Station, Grafton, W. Va.
Benches and the office window inside the train station at Grafton, W. Va.
2. 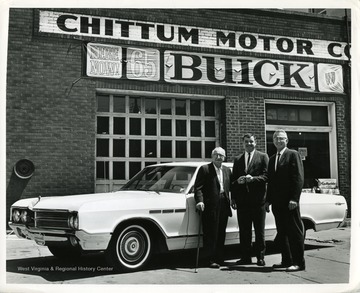 Chittum Motor Company, Morgantown, W. Va.
Chittum Motor Company, Morgantown, W. Va.
Three gentlemen are standing in front of a 1965 Buick at the Chittum Motor Company in Morgantown, West Virginia. 3. 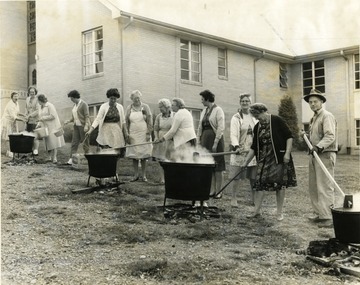 Making Apple Butter Old Fashioned Way, Morgantown, W. Va.
Making Apple Butter Old Fashioned Way, Morgantown, W. Va.
Men and women stir apple butter in large kettles over fires on the lawn of a Morgantown church. 4. 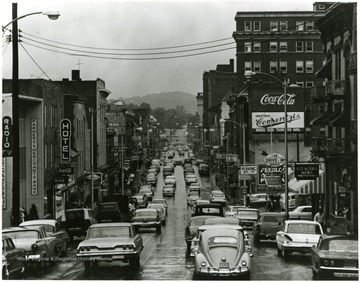 High Street, Morgantown, W. Va.
High Street, Morgantown, W. Va.
5. High Street, Morgantown, W. Va.
Traffic on High Street in Morgantown, W. Va. Business buildings seen along the street. Cars also parked at meters along the street. 6. Grading Courthouse Square For Rejuvenation, Morgantown, W. Va.
Grading Courthouse Square For Rejuvenation, Morgantown, W. Va.
Construction workers are grading the Courthouse Square on High Street in Morgantown for rejuvenation. 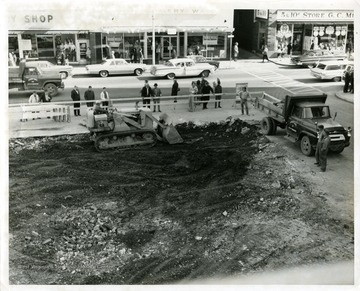 Montgomery Ward and G.C. Murphy Department Stores are across the street. 7. 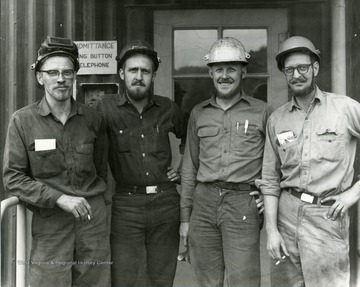 Group of Working Men, Morgantown, W. Va.
Group of Working Men, Morgantown, W. Va. Unidentified workers pose for a group photo. 8. 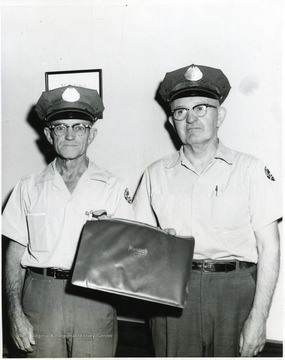 Retired Postmen, Morgantown, W. Va. 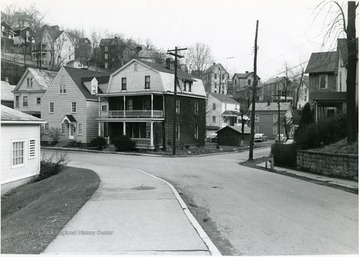 Retired Postmen, Morgantown, W. Va.
9. 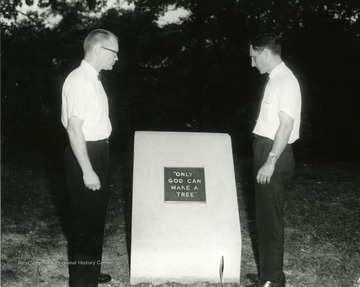 Only God Can Make a Tree Monument, Morgantown, W. Va.
Only God Can Make a Tree Monument, Morgantown, W. Va.
Reverend James Ross is on the right. 11. Police Officer Bill Hughes, Morgantown, W. Va.
Police Officer Bill Hughes, Morgantown, W. Va. 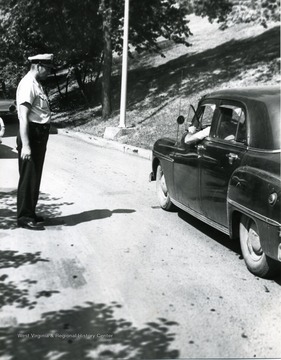 Officer Hughes directs motorists on a busy Morgantown street. 12. 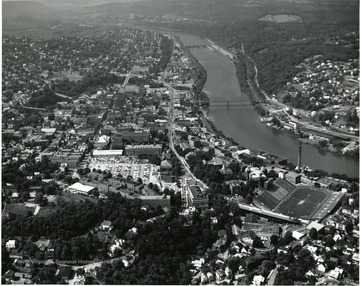 University Avenue and Falling Run Road, Morgantown, W. Va.
University Avenue and Falling Run Road, Morgantown, W. Va.
Where the road splits at University Avenue and Falling Run Road.